For those that doubted the positive impacts from the 49ers moving South, check out the photo below. A staggering 7,500 people packed the San Pedro Square Market to attend the Draft Bash event late last month. This is a win-win all around! The San Pedro Square Market vendors were completely busy, more people were exposed to San Pedro and a new side of Downtown, San Jose benefits from increased tax dollars and tourism (yes I used that word in the same sentence as San Jose), and the 49ers get to host their Draft Bash is one of the coolest venues in the Bay Area. You know what else is nuts... the 49ers were the ones that approached the San Pedro Square Market to host the event, not the other way around. 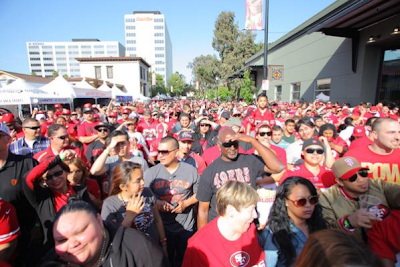 Expect to see many more events like this one in both Santa Clara AND San Jose, and fewer 49er events in SF. After 2017, San Jose should pull out all the stops to make the Niners SJ vs SF. Levi's Stadium will be less then a mile from the city limits of a city over 1 million people. Why should the team carry the name of a much smaller city 40 miles to the north; it shouldn't! Let's do this SJ! I'm on board. I would even be happy with a region-neutral name like the "Bay Area 49ers"